The Scottish wildcat, is there one in Rearcross? Yes, the search is on for a genuine wildcat suspected to be wandering around the remote mountain forests near Rearcross. It's wild, with claws and fangs. And it is believed to be roaming the countryside around North Tipperary. This is not your ordinary tabby. No, its bigger, with a striped bushy tail, and it's not supposed to be a native of this country at all. The search for the wildcat started after Sandra Garvey, who lives in the area, spotted an animal she had never seen before when out driving one night just over two weeks ago. Ms Garvey, who lives in the townland of Knockfune, told The Guardian: "I nearly drove off the road I was so shocked. I saw this thing and what was striking about it was its tail. I saw nothing like it before...It was larger than your ordinary moggie." When Ms Garvey went home and related the strange story to her husband he confirmed that he had seen a similar animal a year previously. Ms Garvey's daughter told the story to her teacher, Jeff Griffin, Vice Principal at Villiers Secondary School in Limerick, and a regular walker in the area, who confirmed that three years ago he too had seen an animal that fitted the description. Ms Garvey contacted the RTE radio nature programme, "Mooney Goes Wild", to tell her amazing story to the nation last weekend. Even the show's presenter, Derek Mooney, travelled to Knockfune to search for the elusive wildcat - alas without any success. When contacted by this newspaper earlier this week, Derek Mooney said there was no firm evidence of the presence of wildcats in Ireland. The species was found in Scotland, Europe and Northern Asia. "There is the possibility that someone brought a wildcat into the country," said Mr Mooney. Another possibility was that offspring of once domestic cats had turned feral and appeared wild looking. "The chances of it being a genuine wildcat are very slight from what I have been told by scientists. You have to prove it and what we are looking for is that if someone sees this creature again they should take a picture,"
The Guardian contacted an expert on the native Scottish wildcat, Alan Paul, who confirmed that the species had never been native to Ireland. The only way the species could have got here was if they had escaped from a zoo or some other form of captivity. "It's very rare for anyone to see a wildcat. They like to keep out of harm's way." Mr Paul said the animal was not a danger to humans, unless provoked. "It will attack you if you corner it. It's no more vicious than any other animal of the same size." Jimmy Greene, a wildlife ranger in North Tipperary up to two years ago, but now patrolling in Laois and Offaly, believes that wildcats do exist in Ireland. Jimmy said he had seen a wildcat and its kitten while patrolling in the early hours in the Slieve Bloom mountain range in Offaly. "I knew straight away it was not an ordinary cat. It was a pure wildcat. You have to be up early in the morning or at night to see them. I didn't think we had them in Ireland before that, but there are also reports of them in County Wicklow." Jimmy said he never saw a wildcat during his years as a ranger in North Tipperary. He believed the animal that Ms Garvey had most likely seen was a pine marten, which, he said, also had a busy tail and were not much bigger than a wildcat. Ms Garvey is still convinced that what she saw could very well have been a wildcat - but maybe not of the genuine kind found in Scotland and parts of Europe and Asia. "Over the years we have had feral cats in this area, but they have grown larger and developed into an indigenous wildcat. They have been interbreeding over the years." 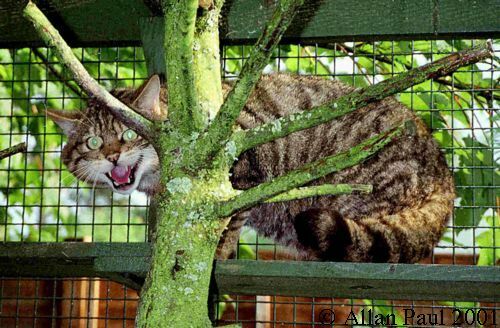 The accompanying photo of a genuine wildcat was given to us by Alan Paul who would be grateful for any information readers have on possible wildcat sitings in Ireland. He has a website dedicated to Scottish wildcats: www.scottishwildcats.co.uk.